With a little bit of help from a boxed mix (plus a few secret ingredients), Claudia’s Easy Triple Chocolate Cake is ready for the oven in about 10 minutes! 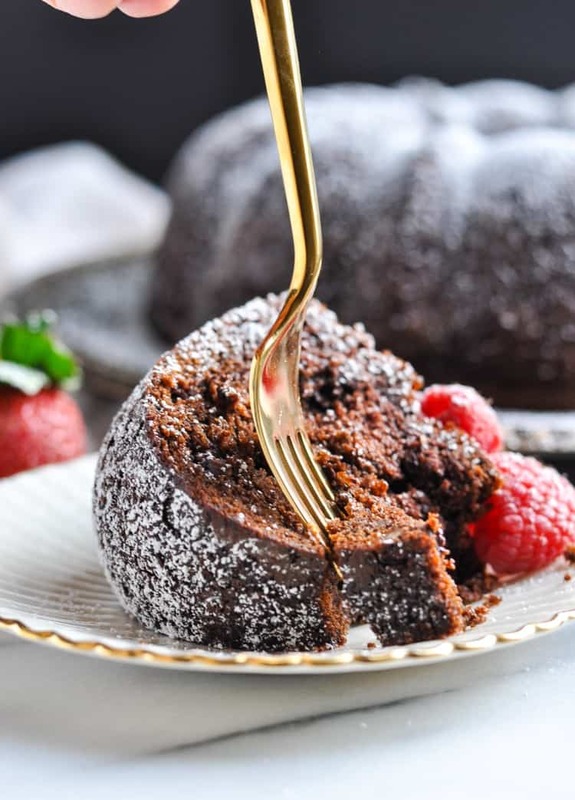 It’s a moist, rich, and decadent dessert that will impress your guests and will satisfy every chocolate craving! I’m not much of a baker, so when I came across this long-lost recipe in my mom’s old recipe box, I knew that it would be perfect for my kitchen! 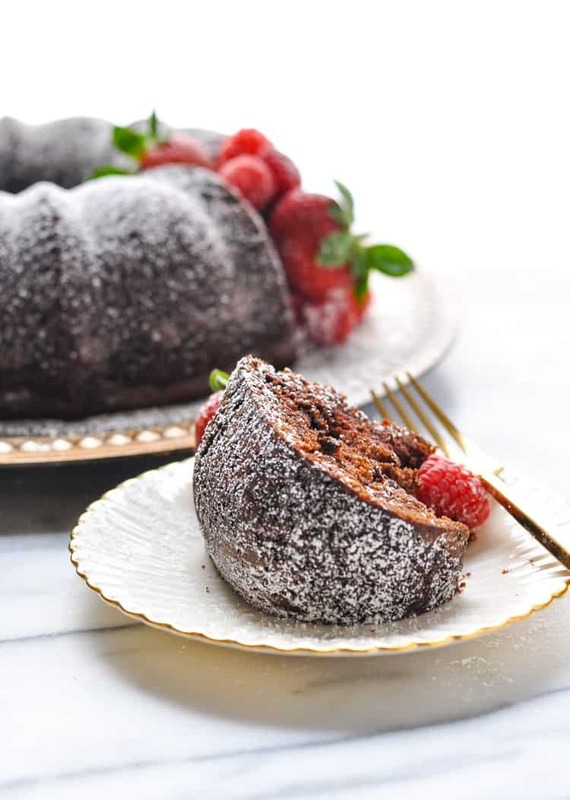 After all, it’s an easy chocolate cake that takes advantage of a boxed mix (and your family will never know)! Whenever I’m asked to bring a dessert to a class party or to a potluck with friends, odds are very good that I’ll grab my favorite brownie mix, throw in some extra chocolate chips, and call it a day. And you know what? Those brownies always disappear FAST! People just love chocolate! Sometimes, though, I worry that a box of brownies just doesn’t seem “fancy” enough…or like I didn’t put in enough effort. It’s probably all in my head, I know! But now, when I need a dessert that’s just as easy as my boxed brownies but looks way more impressive, this Triple Chocolate Cake is my go-to option! It totally reminds me of our favorite brownies, too! 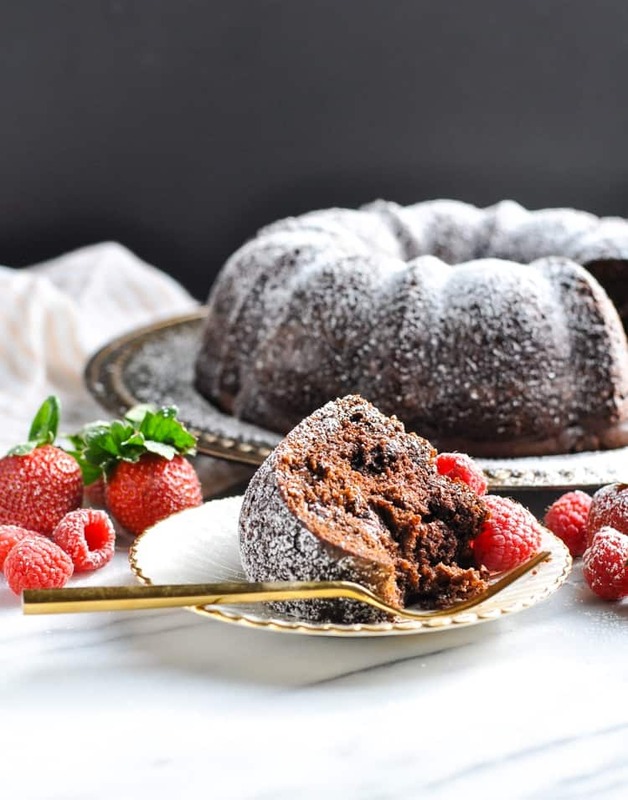 It’s the perfect combination of brownies and chocolate cake, since the Bundt pan gives the exterior a nice crispy texture (like the edges of a brownie), while the inside of the cake stays moist, fluffy, and soft. 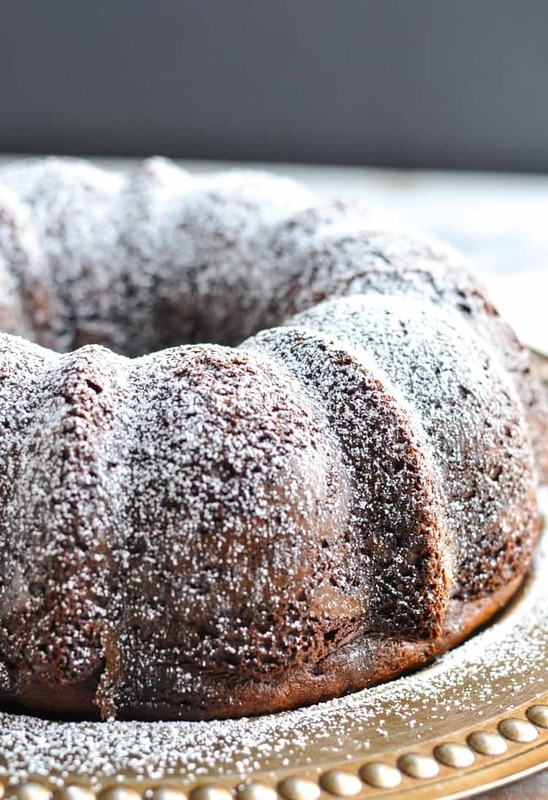 Since the chocolate cake is studded with tons of chocolate chips, you also gets pockets of melty, gooey chocolate in every bite! It’s like the best part of a warm chocolate chip cookie! Oh my gosh, this cake is goooooood. Like I said, I first found this chocolate cake recipe in my mom’s old recipe box. As my parents were packing up my childhood home and moving out of the kitchen that they had used for 35 years, Mom sent many of her old, tattered recipe cards my way (knowing that I would enjoy sifting through them)! I’m not even sure who “Claudia” is (one of my mom’s old friends? ), but her Easy Triple Chocolate Cake recipe is probably 20 years old (at least), just judging by the paper that it was written on. I’m so glad to have found it all of these years later, and to be able to share it with you today! I think of this chocolate cake as the “work horse” of the dessert world. It’s basic, so it can be dolled up for just about any occasion; it’s easy to stir together; and it’s widely appealing to just about any audience. Kids, adults, chocolate connoisseurs…everyone LOVES this cake! Oh!!! And it’s convenient! 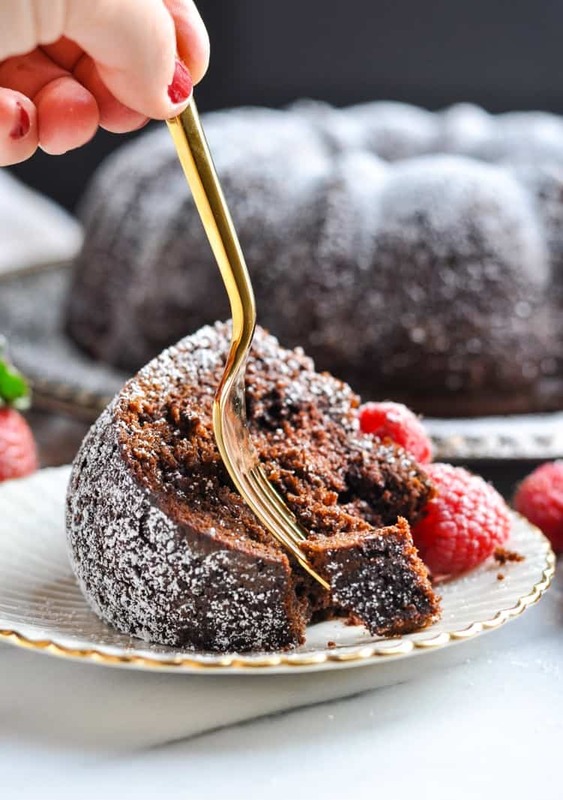 You can prepare the cake in advance and it will keep well on your counter for a couple of days, or wrapped tightly in your freezer for a few months! BONUS! Serve it with a scoop of vanilla ice cream, top it with whipped cream, or keep it fresh with some seasonal berries. No matter how you serve it, I can 100% guarantee that this Easy Triple Chocolate Cake will be a huge hit (and I bet it will replace the boxed brownies in your kitchen, too)! 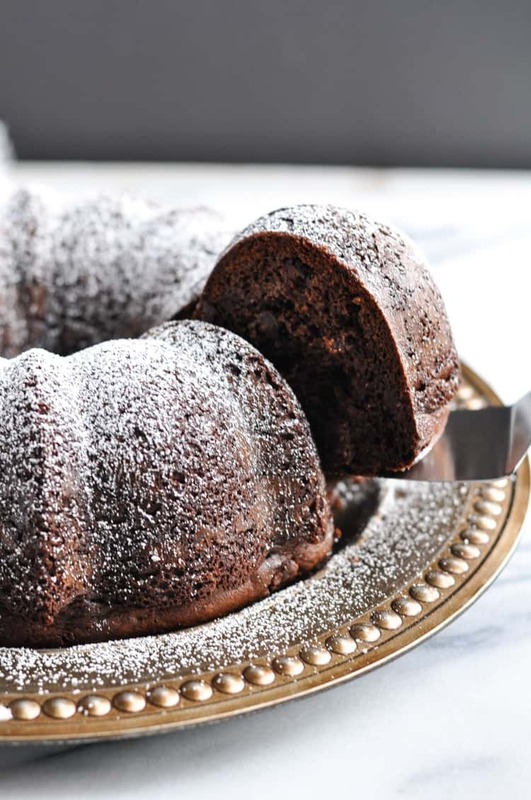 Preheat oven to 350 degrees F. Spray a 12-cup Bundt pan with cooking spray and set aside. In a large bowl, combine sour cream, dry instant pudding mix, cake mix, water, oil, and eggs with an electric mixer on medium speed for about 1-2 minutes, or until thick and smooth. Use a wooden spoon or a spatula to gently fold in the chocolate chips. Bake for 45 minutes – 1 hour, or until a toothpick inserted in the center of the cake comes out clean. Let cake stand for 12 minutes. Invert on a cooling rack and remove cake from pan. 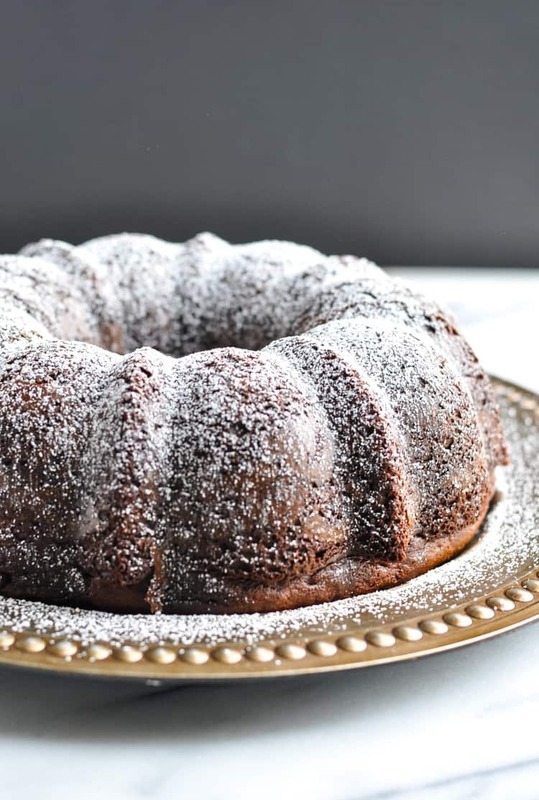 Once cake is completely cool, dust with powdered sugar. Note: This cake can be baked in advance, wrapped tightly, and frozen for up to 3 months. Do not dust with powdered sugar until ready to serve. I wonder how this would be if you used a boxed Chocolate Fudge cake mix (instead of the Devils Food flavor). Thoughts? I love a practical dessert, and this one sounds amazing! I love the combination of cake mix and pudding. Definitely trying this! What about using 13×9 pan? Yes, that should work too! 🙂 Let me know if you give that a try, JoEllen! Hi, Nancy! Your guests will love this cake! I haven’t tried it in the 9 x 13 pan, so I can’t offer any specific suggestions as far as that goes. 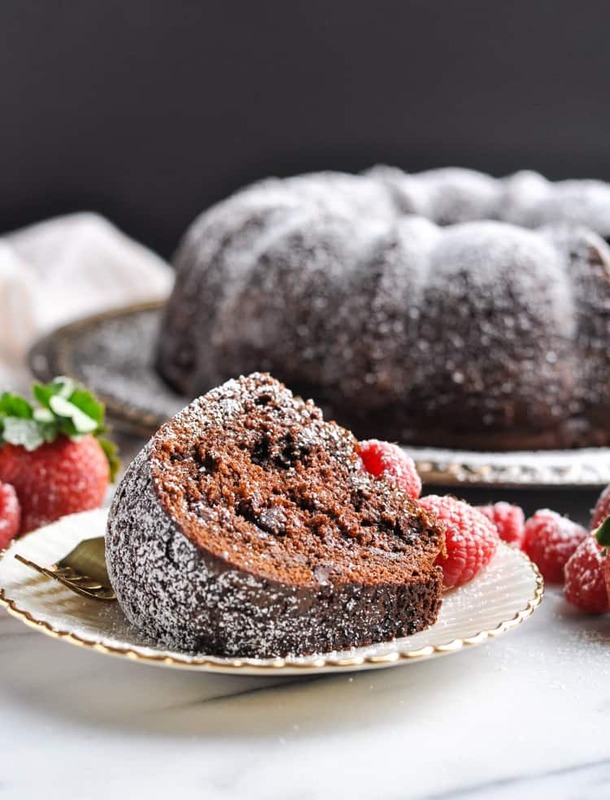 I do know that it will bake faster than the bundt cake, so be sure to keep a close eye on it and make sure that it doesn’t get overcooked or too dry. Let me know how it goes! I have never seen a cake mix recipe with sour cream. What does the sour creme do? Hah! It’s so darn good! Thank you! I have had this recipe for about 30 years. However my recipe has 1/4 cup of dark rum and 1/2 cup coffee instead of the water called for in your recipe. It always turns out great tho.